We present Neumann-Neumann domain decomposition preconditioners for the solution of elliptic linear quadratic optimal control problems. The preconditioner is applied to the optimality system. A Schur complement formulation is derived that reformulates the original optimality system as a system in the state and adjoint variables restricted to the subdomain boundaries. 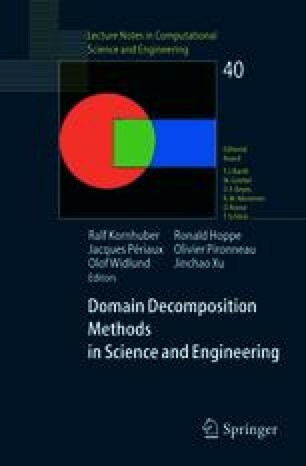 The application of the Schur complement matrix requires the solution of subdomain optimal control problems with Dirichlet boundary conditions on the subdomain interfaces. The application of the inverses of the subdomain Schur complement matrices require the solution of subdomain optimal control problems with Neumann boundary conditions on the subdomain interfaces. Numerical tests show that the dependence of this preconditioner on mesh size and subdomain size is comparable to its counterpart applied to elliptic equations only.